Sam Shropshire awaits a return. The senior and the Wildcats fell in the second round of the NCAA Tournament to California. Northwestern’s season came to a close Saturday in the second round of the NCAA Tournament, as a comeback from No. 8 California (20-7) halted the Wildcats’ early momentum and capped NU’s tournament run. The No. 21 Cats (22-11) opened the weekend with a win over No. 45 Utah State (23-9), in which they recovered from a doubles loss to score a 4-2 victory. Despite falling behind early, senior Konrad Zieba said the team didn’t play poorly in the doubles slate. Senior Strong Kirchheimer opened singles play with a dominant 6-1, 6-2 win at No. 1 singles. 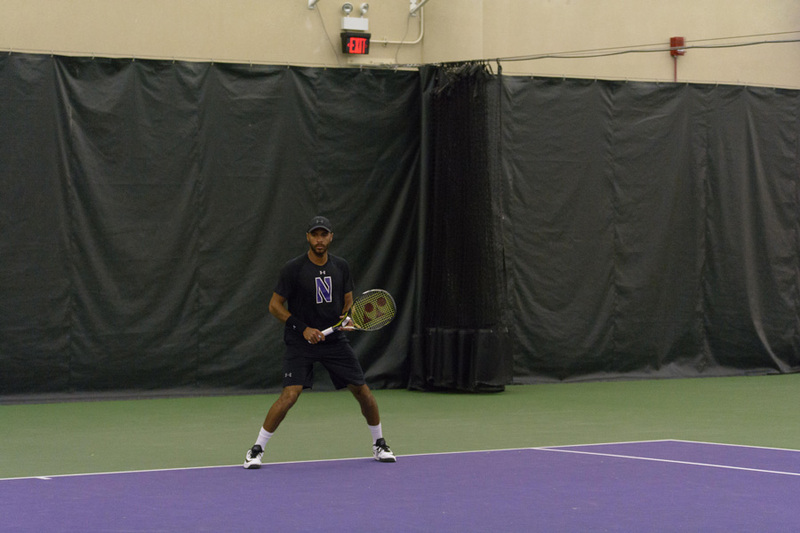 Zieba and freshman Dominik Stary followed up with wins on courts Nos. 2 and 4, while sophomore Ben Vandixhorn dropped his match at No. 5. The pressure fell on senior Sam Shropshire, who — after fending off a match point — broke his opponent en route to a third-set comeback, which ended in the decisive 6-2, 3-6, 7-5 win. Swan wasn’t alone in his vote of confidence. After doing their part to prolong their careers, Zieba and Kirchheimer expected a similar result from their teammate, who rewarded their trust. The win gave NU early momentum in the second-round match against the Golden Bears. Zieba and Shropshire clinched the doubles point with a dramatic 6-4 victory against the nation’s No. 5 doubles team, and the Cats opened singles play with three first-set wins. But Cal found its groove and turned the tide, following straight-set wins at Nos. 5, 4 and 2 with the clinching victory at No. 6. Despite falling short, the Cats said they were proud of their effort. Swan credited the Golden Bears with earning the competitive win, and Zieba said he was proud of his team and fellow seniors after lifting the program to new heights during their careers. And though Zieba, Shropshire and Kirchheimer never ultimately fulfilled their goal of qualifying for the main site, Swan is confident their legacies are complete.